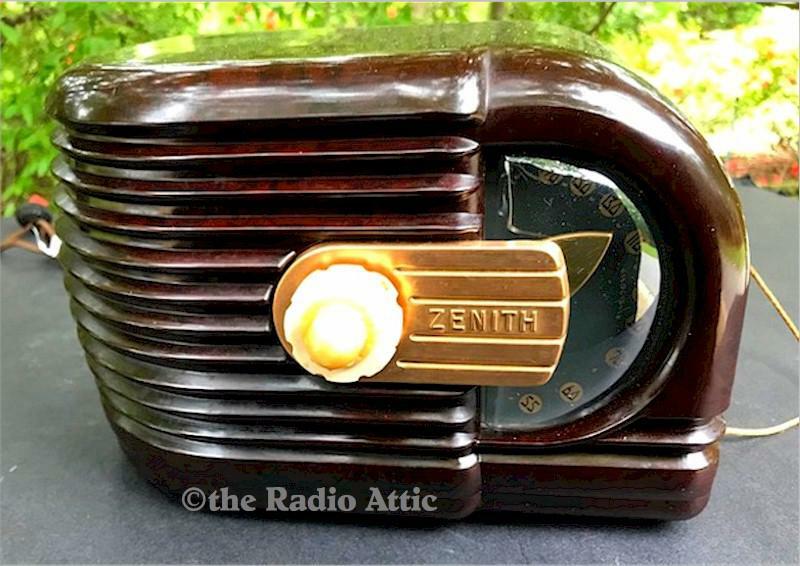 The year 1939 produced some beautiful radios designs, but none better than this Zenith 6D311 tabletop set, which is an icon of the Art Deco period. It was designed by Robert Budlong, one of Zenith's most prolific radio engineers. This beautiful completely professionally restored set in Franciscan Brown originally sold for $14.95. These radios were offered with gold dials or black dials. This radio has the somewhat harder to find black dial. The case is in really nice condition, with no cosmetic issues, no cracks, chips or repairs. It plays fine with just a short antenna wire, but even better with a link to an external antenna, as this model did not have a loop antenna. The dial lamp works fine. It has its original back on the set. About 10-1/2"W x 6-1/2"H x 7"D.
You are visitor number 722 to this page.